We’re ecstatic, giddy & extremely sad at the same time. In four days, it would mark the anniversary of our one year anniversary as contributors to NYCDUMPLINGMAMAS.com. We want to let you guys know that we’ve enjoyed your commentary, your company and your support in the last year. But Winnie Mama & I have decided to close our doors in 4 days. We’ll be embarking on an even more fun journey that involves girly twirls, fashionable designs & clothing for girls ages 2-8 called Sammie Cheeks. We’re in production and haven’t launched yet, but the designs are fresh, trendy & fun. Message us your email address so we can add you to our subscription list for a 10% coupon code exclusive to our loyal NYCDUMPLINGMAMAS readers for when we launch our line, Fall 2014. Till then, enjoy the deals we continue to scout for you in the next few days. Head on over to Olive Garden with this coupon and your kids can eat FREE! Offer is valid now until March 2nd. Limit 2 kids’ meals with the purchase of 2 dinner entrees per coupon. Offer valid for kids 12 and under. This weekend only, Disney Store is giving you an offer you just can’t refuse. You can enjoy a bonus 30% off select styles. Just enter code BONUS30. This Saturday, February 22 at 10:00 AM, head on over to your local Lowe’s to join their Build & Grow workshop for kids. This week they are building a Claw Game. Shutterfly is offering 101 4×6 for FREE. Just enter SNOWDAY at check out. Offer ends tomorrow. We love Tea Collection! Now until Friday the 14th, if you spend $150 or more you can take $25 off you purchase and get Free shipping. 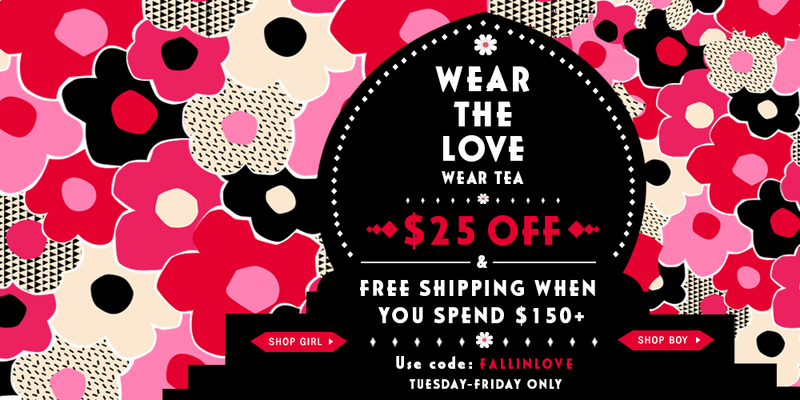 Just enter FALLINLOVE at check out. Check out this awesome surprise sale Kate Spade is having! There are items up to 75% off. Sale runs through 2/13/14 or while supplies last. Shipping is flat at $5 or FREE with a $200 order. Guess what tomorrow is??? It’s National Frozen Yogurt Day! Pinkberry has this awesome deal for tomorrow. They are offering a free small yogurt with toppings. All you have to do is like your local Pinkberry store page on Facebook and then head on over between 3pm- 7pm to get your free yogurt. For local near you, check it out here.